Discussion in '2018 LitRPG Books' started by Jun, Sep 15, 2018. 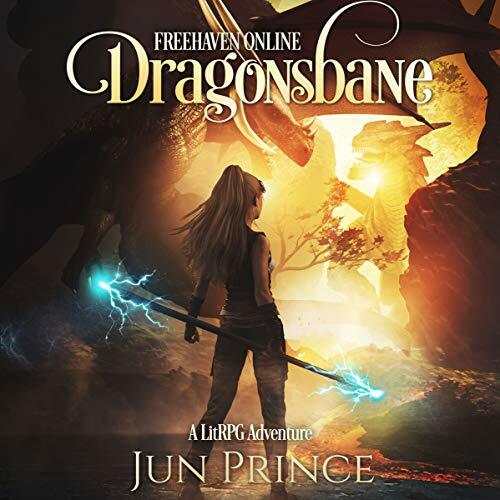 I'm pleased to announce that Freehaven Online: Dragonsbane just went live on Audible! Amy Landon (narrator of Drew Hayes's Forging Hephaestus), as always did an awesome job in her performance. She's also taken the time to create a behind the scenes video (see below), so that you can see what it's like for a narrator to doing takes in their sound booth to get the perfect final production. For those of you who are unfamiliar with the series please find the blurb below. Freehaven Online is more than a game to Justine. By day, she creates monsters for that world, by night she's raiding dungeons. Most importantly, it's her one connection to her dead brother whose buffs still linger within the game. When his virtual shrine is threatened by an update, Justine reforges his guild to complete the Dragonsbane quest in his honor. As an experienced tank, she's no stranger to the bandit attacks, PvP combat, and dragons Freehaven will throw at her. Little does she know, a hacker organization known as Archangel tampers with the update, leaving thousands of players, including Justine, stranded in full immersion virtual reality. As if that weren't strange enough, NPCs are getting smarter, and some marooned players don't want to escape. They're ready to jump at the chance for virtual immortality. Justine must temper the fervent emotions stirring in her guild and unite them to complete the quest. If she doesn't, friends will break from sanity, and others will die in real life. Audible codes will be available for reviewers when they are delivered to me (please PM me for details).